The Nomination Bella Brilliant Edition is a delicate collection with a brilliant sparkle, letting every woman shine in her own special way. The signature dainty sterling silver chains of the Bella collection are decorated with sparkling cubic zirconia stones in four different cuts – Heart, Brilliant, Princess and Marquise – to illuminate any look and highlight natural beauty. 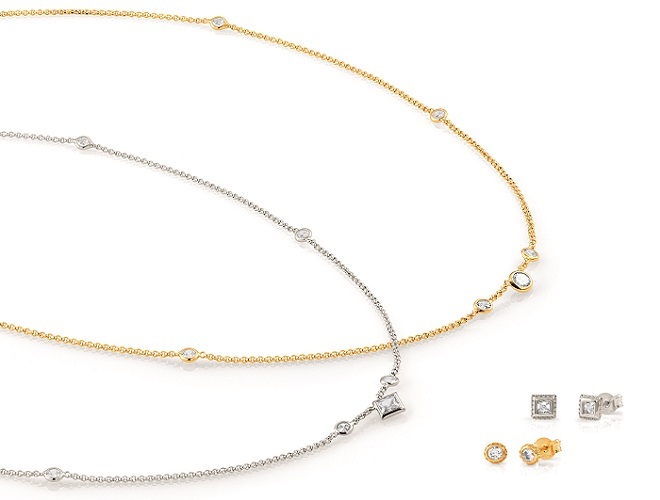 The entire collection is made in Italy and each necklace, bangle or chain bracelet, earring and ring, depending on the cut of the stone, is available in classic silver, 24K yellow gold or 22K rose gold plated finish to bring a hint of glamour to complete your look. Nomination is the worldwide leader in steel and gold jewellery. All made in Italy, Nomination produces fashion jewellery for men and women using materials of the highest quality: stainless steel, 18K gold, cubic zirconia, precious and semi-precious stones and natural diamonds. Nomination’s brand philosophy was established with the creation of the composable link bracelet in 1987. The composable bracelet is made up of a series of interchangeable precious links that allow you to personalise your bracelet to express your style and personality. Nomination, synonymous with quality, originality and innovation, is an international brand with more than 5 000 independent retailers and 70 mono-brand stores around the world. For more information about Nomination and their collections, click here. Beautiful collection. Clean cut design. Simple but still unique and fresh. I am a huge nominations fan . Love the product. Very elegant and dresses up a simple garment for any occasion. I have converted many people looking for gift ideas. Receiving a gift from nominations would be amazing! The italian style,deisign and craftmanship of Nomination inspires me .Both my daughters and I worked at jewellry outlets and we witnessed the satisfied customers from their purchases. The trend will never die due to the uniqueness of the fine jewellery which is designed for the young and old. I love the fact that Nomination tells a story.Paulo Gensini is an innovative founder who certainly made gifting much easier with his brilliant designs to suit all ages.My first piece was an Obsidian bracelet the the rest followed and i am so in love with Nomination that another gift from the range would be a definite bonus! Nomination is a touch of class. Love this website and winning with Nomination would be O so perfect!